The sinking of the Iolaire has been and continues to be the source for many poems, songs, paintings, books and other artistic work both in Gaelic and English. This section highlights just some of this artistic output and shows how the story has been interpreted through artistic works from 1919 to the present day. Gaelic song recorded in 1970 and sung by Flora McCuish who was born in 1898 and was a native of Berneray, Isle of Harris. This is a lament for those who died when the Iolaire sank. The bard thinks of the sorrow of those left to mourn. The song sung here is by Hector MacKinnon of Berneray and comes from a manuscript of his songs owned by his daughter Nellie MacKinnon. Recorded in 1972 and sung by George Gow who was born in 1885 and was a native of Sutherland. This Gaelic song was composed by the singer’s father. Gaelic song recorded in 1977 and sung by Mary MacRae who was born in 1892 and was a native of Uig, Isle of Lewis. These three songs represent just a small selection of the musical responses about the sinking of the Iolaire. You can find more at Tobar an Dualchais. Composed by poet Anna Frater, a native of the Isle of Lewis and first published in 'Fon t-slige Under the shell bhàrdachd le Anna Frater/Poems by Anna Frater'. in the grey seas of your eyes. and through each New Year that followed. and that left a hole. 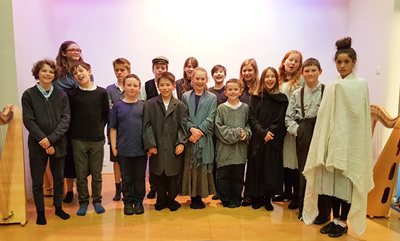 Through drama and song, P7 pupils from Taobh na Pàirce (Parkside Primary, Edinburgh's dedicated Gaelic primary school) performed a play about the Iolaire in June 2017 for the public at the National Library of Scotland. Written by William Hershaw and directed by Ann McCluskey of CnaG, the play was performed in Gaelic and an English synopsis was provided.